Welcome to my little bit of blogland! There is a new challenge over at The Crafting Musketeers and the theme is Weddings. 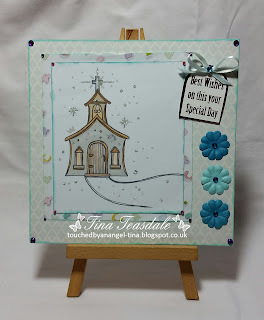 Our sponsor for the challenge is The Stamping Boutique and I have used the gorgeous Wedding Chapel image. Here is a card that I have created for the challenge and I hope that you like it. I used a 6x6 card blank and added paper from my stash in a mat and layer. Next I added the topper that I created by using the Wedding Chapel image colored with Copics with a little bit of glitter to highlight here and there. To finish I added some gems, paper flowers, ribbon bow and a sentiment. Pop over and join us for the challenge to be in with a chance to be a winner or in our top 3. Wonderful card, love the image, design and colour! Hi Hunny, this is gorgeous, beautiful church and pretty embellishments.